The LG 25UM65-P monitor is one of the most affordable ultra-wide Full HD monitors. For a very reasonable price, this beautiful slim bezel monitor offers a stunningly immersive gaming and movie watching experience and extra horizontal workspace for various multitasking activities. In addition, the picture quality is flawless thanks to the 8-bit IPS panel which provides accurate and vibrant colors. It’s safe to say that the LG 25UM65 both looks and performs perfectly. The UltraWide Full HD image consists of the 2560×1080 resolution at the 21:9 aspect ratio which may at first appear to you as too wide for its length. However, after some time getting used to, the extra horizontal space will make you wonder how you ever got around without it as video games and movies appear more immersive while the professional multitasking activities become easier due to the spacious screen. 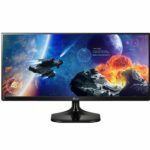 When it comes to gaming, the ultra-wide resolution makes for a more mesmeric experience in RPGs while in FPS and racing games, players get an advantage over their opponents as they have a wider overview of the enemies lurking in the corners. However, keep in mind that some games don’t support this resolution and that you will have to modify the games if possible with fan-made patches or add-ons. In case it’s not possible, you can always play with the 1920×1080 resolution, but you will have black borders on the sides of the screen making the image appear smaller but still unhindered quality-wise. Besides requiring the compatible resolution, video games do not demand any other extra feature or a more powerful computer rig for games to fluently run at 21:9 aspect ratio. 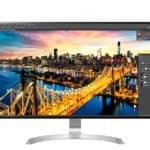 The IPS panel of the LG 25UM65 PC monitor makes for the accurate and consistent colors that cover 100% of the sRGB color space allowing professional designers and photographers to efficiently do their work. Moreover, the panel ensures the impeccable viewing angles of 178 degrees both horizontal and vertical which eliminate color shifting from basically all angles. The only specification that is slightly lesser than expected is the response time which is the amount of time that pixels take to change from one color into another. As opposed to the 14ms response time of the LG 25UM65 1080p display, modern IPS panels provide up to 4ms. However, 14ms is still fast enough to eliminate ghosting in the everyday use, however, in the fast-paced FPS games, there will be some noticeable blur present. While such response time speed is critical for the high-end competitive players, it can be neglected by the casual gamers. More importantly for gamers, the LG 25UM65 provides surprisingly low input lag which is a more important factor. 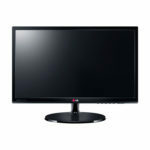 As most of the LG monitors, the LG 25UM65 IPS display features a joystick rather than buttons for navigation through the OSD which makes for quick adjusting in the user-friendly menu. When not in the menu, the joystick can be used as a shortcut for some of the functions including the Picture by Picture mode and applying the Reader Mode. The Reader Mode is a pre-calibrated picture preset which has reduced levels of the harmful blue light. In combination with the flicker-free screen of the LG 25UM65, you will be able to watch the screen for hours to an end without straining your eyes. There are three more well-optimized picture presets including Game, Cinema, Photo, Energy Saving, and Custom. Furthermore, in the OSD menu, you will be able to configure the common parameters such as the contrast, brightness, volume of the internal speakers, and the aspect ratio which includes Wide, Original, Cinema 1, Cinema 2, and 1:1. The cinema aspect ratios provide you with a black border at the bottom of the screen for the subtitles. In addition, you will be able to adjust sharpness, response time, and the black level feature which increases visibility in the dark scenes. Lastly, you can tweak gamma, color temperature, and levels of the six-axis colors. The LG 25UM65 IPS monitor also comes with a Screen Split feature which allows you to split your screen into several different layouts. Then, you can simply drag an application towards the divided area and the window will stay fixed there. This feature can be very helpful for those who frequently multitask, especially the layout which divides the screen into three balanced areas. The LG 25UM65 features a very slim bezel which in combination with the 21:9 aspect ratio make for an amazing cinematic experience. The cabinet of the monitor is glossy while the screen is covered by an anti-glare 3H material which eliminates the sunlight reflection. There are 75 x 75mm pattern holes for the VESA mount so you can place the monitor on the wall. The base is detachable but it lacks other ergonomic functionalities as only the screen of the monitor can be tilted by -5, 20 degrees. The LG 25UM65 PC screen features a DVI-D port, two HDMI, a DisplayPort, and audio ports which can be used either for the built-in speakers or headphones. The built-in speakers perform exceptionally well and deliver a loud and clear sound quality with 2x3W of power. 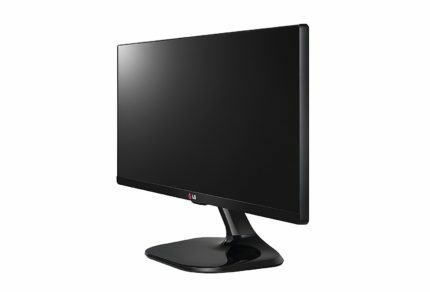 At the moment (May 2017), the LG 25UM65 is available for around $220. However, depending on the availability the price is prone to increase and decrease. 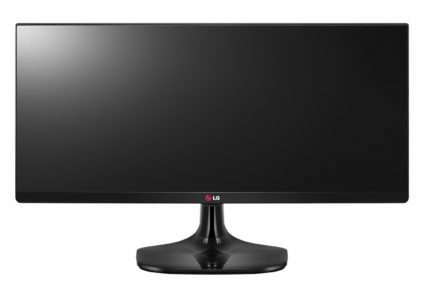 There is also a new version of this monitor, the LG 25UM57, which is a bit more gaming-oriented. You can check our review about it as well. The LG 25UM65 monitor offers an amazing and immersive gaming and movie watching experience with a crisp resolution and vibrant colors. The extra horizontal space and the color accuracy make for an ideal monitor for the professional designers and alike as well. With the ultra-slim design and the cinematic 21:9 aspect ratio, you can watch the movies the way they are meant to be viewed. This monitor performs flawlessly, offers more features than you can expect at this price point, and simply looks astonishing. The LG 25UM65 is one of the most affordable monitors that offer the immersive UltraWide Full HD resolution. Moreover, it features a beautiful slim bezel design, many unique features such as the built-in speakers and screen split feature, and an outstanding performance and image quality.